Moving can be stressful. That is where we come in. Whether you are moving to another part of Georgia or another part of the world, A.C. White has developed a system designed to carry the boxes and the stress for you. At A.C. White, we strive to provide the best residential moving service. Do not worry if your items will arrive on time. Do not stress about your things getting broken. As an agent for United Van Lines, A.C. White can safely and efficiently handle every aspect of your move from start to finish. 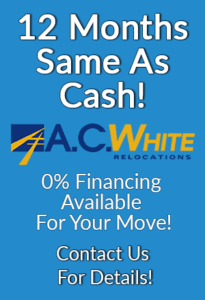 The rates and moving options at A.C. White are extremely competitive and tailored to meet your specific needs. We even offer 0% financing. See what we can do for you today, get a FREE quote for your next move now. A great moving experience starts with proper packing. You may decide to pack some or all of your belongings, or you can leave it up to the professionals at A.C. White. Either way, we will be there to support you during this important step. Since we have been in the business for close to a century, we know the ins and outs of an efficient moving process. We can properly pack and relocate your most precious belongings across the state or across the country. If you ever have any questions, a personalized moving coordinator will guide you every step of the way. After over 90 years of moving, A.C. White has moved just about any item you might imagine. From large family heirlooms to priceless collections, we know the proper methods for moving specialty items, so that your precious possessions are completely taken care of in transit. No move is too large or complex for the experts at A.C. White. No matter if you are moving to or from the Atlanta area, your experience will be as stress free as possible with your own personal moving coordinator. That’s right! A.C. White is an Atlanta moving company that will assign a personal moving coordinator to be with you every step of the way. We understand that questions come up all the time when moving, and your personal A.C. White moving coordinator has the answers you need. Your personal coordinator will follow up with you throughout the entire moving process, keeping you informed the entire time. Make your next moving experience a pleasant one. Contact A.C. White today to find out more. There is a reason that A.C. White was named one of the Best Places to Work by Georgia Trend. We are a family business, and our entire extended family wants your family to have a great moving experience. Many of our employees have been working here for more than 20 years. This means that our staff of movers is the most experienced available and will take great care with your personal belongings. City Pointe is a valuable resource available for your moving needs. City Pointe will connect you with a network of realtors to facilitate the sale and/or purchase of your home. City Pointe will also provide you with profiles of your new community, and the use of City Pointe may make you eligible for cash reimbursements for your move.